To be able to simply manage your warehouse is a must for every seller. It is necessary in order to have an efficient work routine, better order fulfilment strategy and save time spent on administrative tasks. Being able to efficiently track current, incoming and outgoing stock in one dashboard saves a lot of time and effort. Multiorders will help you get your warehouse under control. Warehouse management will be much easier with our software. In Multiorders you can set bin locations in order to easily find the items in your warehouse. You can assign one easily by clicking the item in the inventory and add the bin location in any format. This is a great feature if you don’t want to spend time looking for the item and would rather just find it easily. Also, there is a possibility to set a barcode, which will be secured with Multiorders. With Multiorders you can merge products without worry. If you are selling the same item on multiple sales channels, there is a constant burden to keep in check with your stock in order to prevent overselling. Therefore, product merging is the best thing you can do. Once you merge products in Multiorders, you do not need to stress about your stock when you make a sale. All of your integrated stores will be automatically updated to the new stock level. A great feature you can set and forget is reorder points. If all your inventory takes around the same amount of time to restock or manufacture, you can set a global reorder point which will apply the same number to the whole inventory. This way you won’t have to worry about unexpectedly running out of stock ever again. If your inventory has a lot of variety, reorder points can also be set separately for each product. This way, you will always have a safe buffer while you restock. This will give you enough time to contact your suppliers. Pick lists is another amazing feature of Multiorders. You don’t need to check where the items are one by one. With our software you can mark all of the orders you want to pick and print a picking list for all of them at once. That way you will get a sheet and easily find the sold items in the warehouse. 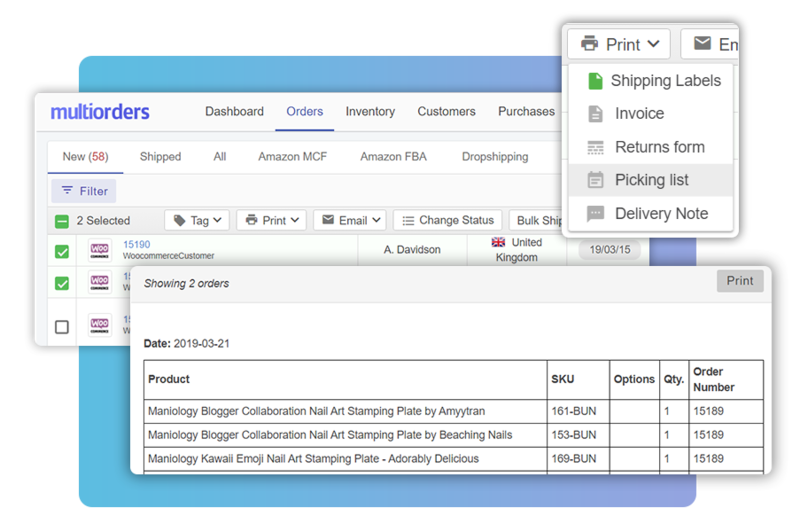 You can quickly create purchase orders for any of your inventory items with Multiorders. Our software will automatically fill out the required information. All you will have to do is send it to your supplier. When you receive your items click “Receive order” and your stock levels will be automatically updated and distributed to the relevant stores by our warehouse management software. Do you still keep your inventory in a spreadsheet? When you start using Multiorders, simply upload it to our system. You don’t need to painstakingly recreate every product. Just click import, add your spreadsheet and your inventory will be there. Want to open an online store that lets you import listings without creating them one by one? Export your inventory from our software and easily create a whole new array of products for your new shop. There’s no need to go through the hassle of creating every single product by hand anymore.